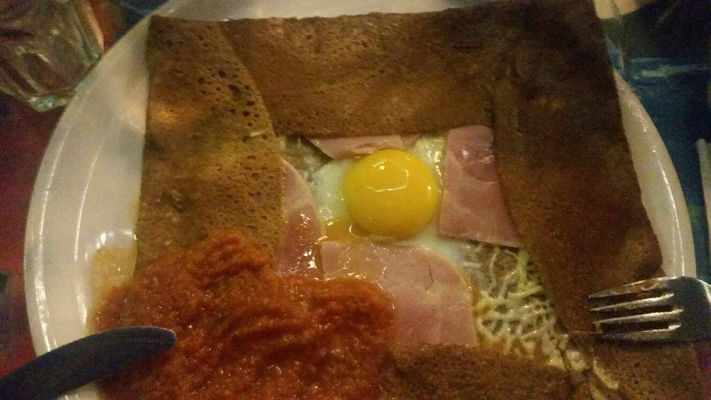 Au Vieux Quimper Restaurant in Saint-Gilles-les-Bains is a Breton crêperie which offers a wide choice of buckwheat pancakes. and sugared crêpes, as well as salads, traditional cider, and home-made ice cream. Meals served on the terrace. Open every day from 12:00 midday to 11:00 p.m. non-stop. Environment / Access : Head for Saint-Gilles-les-Bains. Once in the main street through the town centre, turn at the Crédit Agricole to reach Place Paul Julius-Bénard (Saint-Gilles market square). The crêperie is near Galeries Amandines and the Tourist Office.